Christmas cactus (Schlumbergera bridgesii) is a wonderful plant to give as a gift as it naturally blooms around the holidays. If cared for properly, it will produce lovely blooms year after year, just in time to brighten the gloom of winter. While it is usually considered an indoor plant, with the right conditions it can spend time outdoors in the summer months and still thrive. The Christmas cactus (Schlumbergera) is not a desert plant. It is a tropical succulent that originated in the rainforests of Brazil. Because it lives in trees or shaded rocky areas in the wild, it adapts marvelously to indoor lighting as a houseplant. It can thrive outdoors during the summer months once night temperatures are over 60 degrees Fahrenheit in all USDA growing zones. Christmas cactus thrives indoors with bright, diffused artificial light. Outdoors, however, direct sunlight can be too strong so choose where the cactus will spend the summer carefully. Shady areas such as covered patios are ideal. Sunlight that is filtered by other plants or perforated walls and trellising will also protect the cactus from too much sun. If the soil is moist but the leaves are limp or the leaves develop a red tint, the cactus is receiving too much sun and needs to be moved to a shadier spot. Being a tropical plant, Christmas cactus can be sensitive to extreme heat and dry conditions. It may need water more frequently during the heat of the summer. In areas with low humidity it may be necessary to increase the humidity around the cactus. Place a layer of rock or gravel in a tray at least an inch deep and several inches larger than the pot and place the pot on the layer of rock. Keep this tray at least halfway filled with water. As the water evaporates it will increase the humidity immediately around the Christmas cactus. 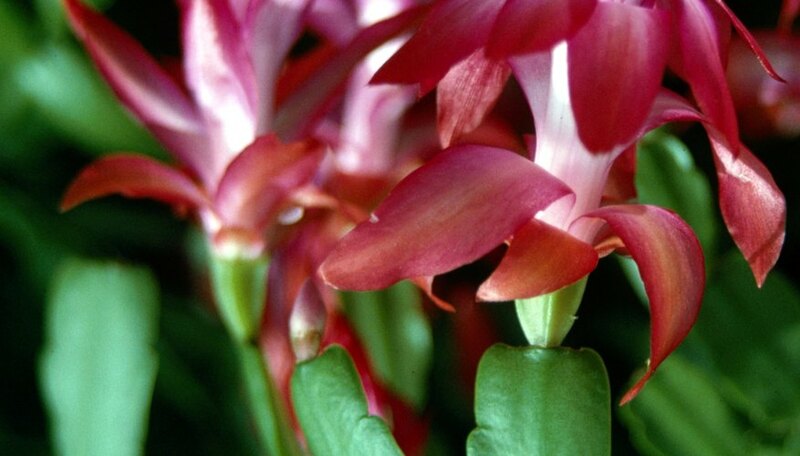 The jointed stems and leaves of the Christmas cactus are easily broken by touch. Branches that are broken off will not bloom for a year, sometimes two. Use extreme care while moving the plant outdoors not to damage the plant. Place it in a protected area to prevent damage from people or pets brushing against the plant. As with any plant grown indoors, a Christmas cactus needs time to adjust to an outdoor environment. Begin by placing it outdoors for only an hour at a time. After three or four days, increase the time to two hours. Repeat this cycle, increasing by an hour each time. Once the cactus is up to five hours it should be able to withstand being left outdoors full time.